This is a die-cut Wyeth Tires porcelain sign. This particular Wyeth Tires sign is red, white, and blue. 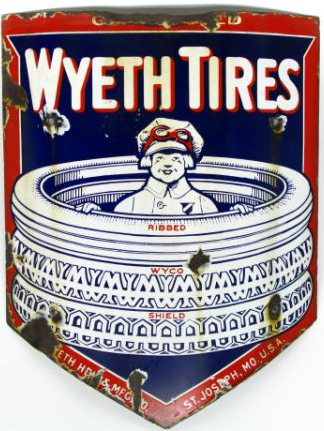 It reads, “Wyeth Tires, Ribbed, Wyco, Shield, St. Joseph, MO, USA” and features a small child wearing goggles and sitting inside a stack of tires in the center of the sign.